Humans liked to be entertained. I think that is a pretty safe statement for the most of us. But “entertainment” can take on a completely different meaning depending on the person or people. Completely. The first thing that popped into my head was when we went “house hunting” for the first time in Charleston, SC. Nothing brings this to light more than house hunting. You get to see other people’s lifestyles, and the things that are important to them. Especially when it comes to being entertained. For instance, it is obvious who the TV watchers are, or the wine drinkers, or the sports fanatics. We were the most surprised when visiting a very unique and eclectic house on Legare Street. On the third floor of the house were several small bedrooms, which were all connected by doors, not hallways. One right after the other. And in the very last room was a rather impressive display of chains, handcuffs, cameras, and various other mechanisms. All were hanging from bars and other fixtures on the ceiling and walls. Our Realtor, who we had just met a few hours before, was a very fine and genteel southern lady. When we entered the room, she said, “Ooooooh mmmmmyyyyyyyy.” Quote. Unquote. So yes, entertainment takes many forms. For me, on Sunday, it was watching the Masters’ Golf Tournament. I had kept an eye on the leader boards on the previous days. And while I “enjoy” watching golf, I never make a point of it. But seeing Tiger Woods win the Masters, his fifth, was truly entertaining. It was just plain fun to watch. And since we are on the subject of “watching” — it seems that The Game of Thrones is everywhere in the news right now. Every paper and magazine are featuring articles. Every news show has been hosting the actors. It seems to be a very hot topic. I have never seen an episode, and it doesn’t look like something I’d go for. I’ve never heard anyone talk about either, except for two students, one in high school, and one in college. I’m wondering how may people my age are watching? Apparently it is keen entertainment for many. So yes. Entertainment comes in many forms. Some people like to jump out of airplanes. Others like to knit. And still others enjoy art museums. It depends on the person. Movies, music, books, food, and on. I just read an interesting article this morning about Dubai. 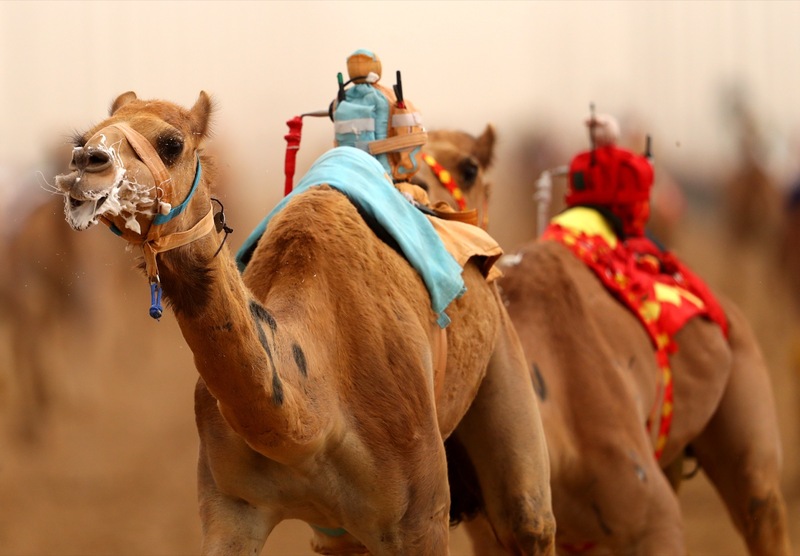 Camel Racing is their go-to sport of choice. 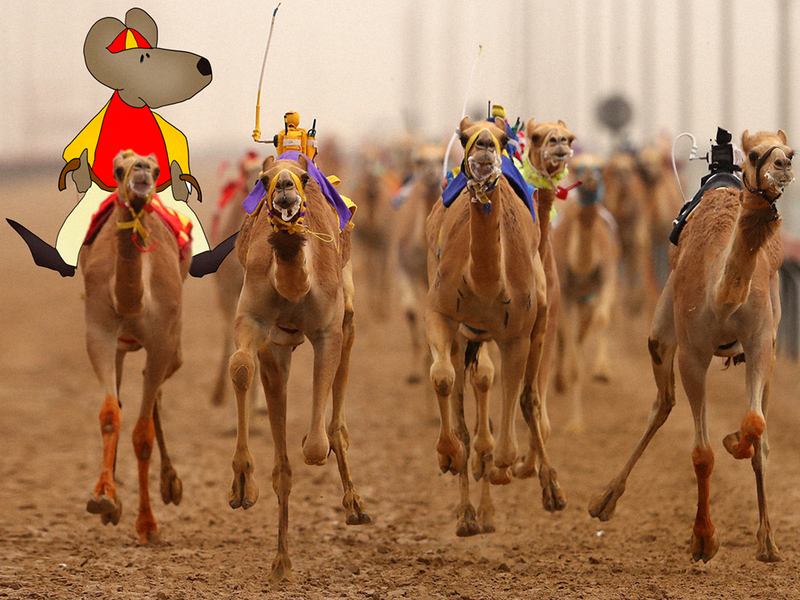 But they use these little tiny robot jockeys, instead of humans to race the camels. I don’t know how well they treat their camels, but the people there are crazy for this sport. But what it comes down to is this. Entertainment is actually a need for us humans. Sometimes it can even be addictive. But there has been a lot of work in Psychology to explain it. And, areas such as cognitive neuroscience and developmental psychology have gone a long way in making sense of this. So the next time you are having a beer and a hot dog at the baseball game, OR, brie and crackers at the ballet, you are actually experiencing narrative transport. Entertainment. They have found that men need this more, and smart people don’t need it as much. And, now you will have to excuse me, because I have to go play a game of “Color Bump” on my iPhone.